Johanna Kinkel was the daughter of a gymnasium teacher. He parents encouraged a musical education and she was taught piano and composition by Beethoven's former teacher Franz Anton Ries. In 1832 she married music merchant J.P. Matthieux. She left him after six months, but the formal divorce took several years. After a period of depression Dorothea Schlegel brought her into contact with Felix Mendelsshon in 1836. He encouraged her to pursue a musical career. She moved to Berlin, where she was taught by K. Böhmer and W. Taubert. At the same time she worked as a piano teacher and the daughters of Bettina von Arnim were among her pupils. She performed at Fanny Hensel's Sunday sessions and Schumann praised her work. Because of her divorce proceedings she returned to Bonn in 1839. She became very active in the musical life there and worked as a performer and as a conductor. In 1842 she married the protestant theologian Gottfried Kinkel and she became a protestant herself. Together they founded the literary group the Maikäferbund. They had four children. During the revolution of 1848 her husband was elected to represent Bonn in the National Assembly in Bonn, but he was arrested. His death sentence was changed to imprisonment for life, but Karl Schurz enabled him to escape from Spandau Prison and he fled to London. There he was joined by Johanna and their children in 1851. In London she gave piano lessons and singing lessons to children and wrote and directed music. She also wrote a novel. Her husband hardly took part in the household and continued his political activities. Possible he had a relation with another woman. On 17 Nov 1858 she was found dead in her garden. It was unclear if the had fallen or had jumped from her third floor bedroom window. 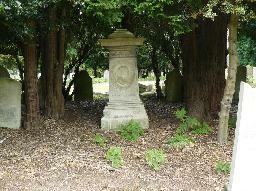 The grave of Johanna Kinkel at Brookwood Cemetery, Woking.